They may have evolved to make the trip, but migratory birds are still tired after flying for thousands of miles. As a major stopover for roughly 300 species of birds, Chicago’s lakeshore can be a good place to rest. Building off similar work east along the waterfront, the Chicago Park District will restore native habitat for migratory songbirds along a 2.2 mile strip of land sandwiched by railroad tracks and Lake Shore Drive between 31st and 47th Streets. 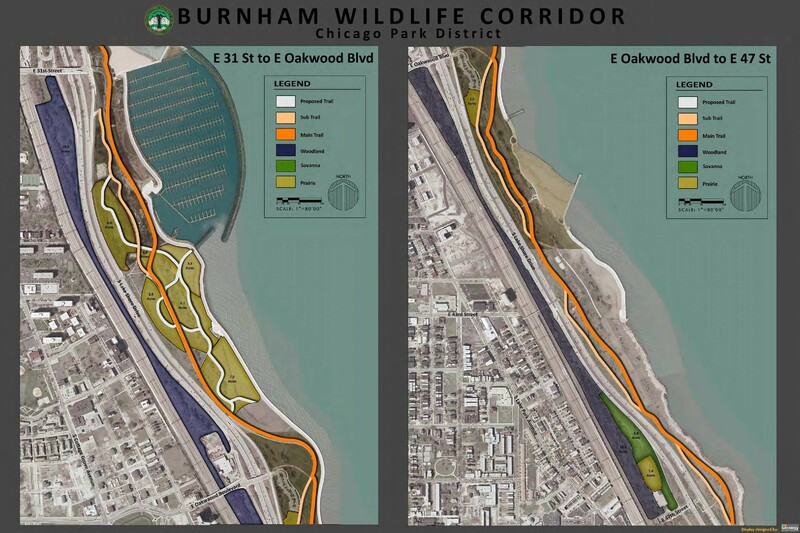 The Park District is calling the 103-acre parcel the Burnham Wildlife Corridor. It includes land east of Lake Shore Drive, where restoration is already underway. Shirlee and Douglas Hoffman, both retirees, live on 32nd Street, just steps from the proposed site. The Hoffmans said they have seen more kestrels, hawks and warblers than ever before since work began on the corridor several years ago. Most of the new 41.5-acre stretch will be woodland, seeded with oak species known for fostering hundreds of species of caterpillars — a key component of migrating songbirds’ diet. In August, Park District officials hope to organize a massive volunteer event to plant 125,000 trees in one day. Before then the Park District will have to clear out invasive buckthorn and cottonwood that has taken over this narrow outpost. Years of runoff from the neighboring highway and railroad tracks have only worsened an already lackluster soil profile. But oaks are hardy, park officials said, and should take root once restoration work clears the way. This isn’t a restoration project per se — the land originally came from lake fill, so it’s more accurate to look at the Burnham Corridor as habitat enhancement. If it is successfully rehabilitated, this skinny strip of neglected land could become a welcome layover for the more than five million birds that pass through Chicago each migratory season.